The co-main event for April 21st’s LFA 10, will see a Flyweight contest with JacksonWink MMA’s Nick Urso against Factory X product Brandon “Raw Dawg” Royval. 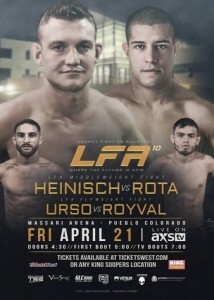 LFA 10 takes place at the Massari Arena, in Pueblo, Colorado, with the main card televised on AXS TV. 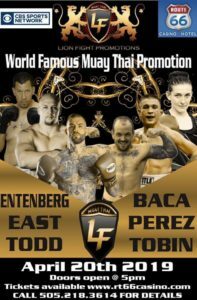 Urso who started his martial arts training in Muay Thia, has won 2 of his last 3, with decision wins over Josh Montoya and Kenny Porter, showing a new level to his wrestling game. Urso will be looking to rebound from a 2nd round TKO loss to Nick Mamalis. Royval has won 3 of his last 4 fights, knocking Danny Mainus out at WSOF 29, then losing a unanimous decision to Ricky Palacios at Combate 7, rebounding at Sparta Combat League 53 submitting Angel Hernandez, and is coming off a LFA 5 1st round submission of Rakan Adwan.